This community-focused tour, which can be tailored to your own interests, takes in country highlights and exciting new destinations only recently made accessible. The temples of Bagan; the ancient capitals around Mandalay; and floating villages of Inle Lake are all included - as well as remote, mountainous and tribal Chin and Kayah states, where you will be accompanied by local ethnic guides, offering a fascinating insight into these culturally unique areas. Upon arrival at Yangon International Airport, you will be welcomed by your Go-Myanmar.com representative and transfer to your hotel. Once refreshed, and depending on your schedule, take a downtown heritage tour of the largest collection of colonial-era buildings in Southeast Asia and then a sunset visit to the magnificent Shwedagon Pagoda, the most important religious monument in Myanmar and a point of pilgrimage for Buddhists across the globe. You will have dinner at Shwe Sa Bwe, a social enterprise and restaurant training centre, where young Myanmar people from underprivileged backgrounds are offered free hospitality training. It is a stylish and delightful place to eat, with a range of tasty dishes (car transfer included, but meal at your own cost). Take an early morning flight to Mandalay, the last capital of then-Burma’s Konbaung Dynasty until its decline in 1885 at the hands of the British. After checking in to your hotel you will visit another former capital, Amarapura, just to the south of Mandalay and home to the elegant U Bein Bridge - the longest teak bridge in the world. Nearby is the historic Mahagandayon Monastery, where you can take part in the time-honored tradition of making an offering to the Buddhist monks. In the afternoon, take in Mandalay’s sights and witness the extraordinary range of pagodas and monasteries in Myanmar’s religious capital. Highlights include the highly-revered Mahamuni Pagoda, a place of pilgrimage for Theravada Buddhists, and the intricate, wood-carved Shwenandaw Monastery. Finish with a spectacular sunset over the city from Mandalay Hill. After breakfast, visit another ancient capital close to Mandalay, Inwa (Ava). Founded in 1364, Inwa was a seat of power on and off for 400 years. Highlights include the elegant ‘leaning tower of Ava’, Maha Aungmye Bonzan and the teakwood monastery of Bagaya Kyaung. In the afternoon, head across a vast bridge spanning the Irrawaddy River to Sagaing, which was the capital of a powerful kingdom in the 14th and 18th centuries. Enjoy the unique view of hundreds of stupas dotted across the hills of Sagaing on the banks of the Irrawaddy, from where we will enjoy sunset before returning to Mandalay - where you will have the chance to try some of the city's famously tasty street food, supporting small-scale business by buying from local vendors. Transfer to Mandalay Airport for your flight to Nyaung U, for the Bagan temples. After checking in to your hotel, enjoy an archaeological tour of this vast and unique plain, taking in beautiful and historically significant sites such as the Damayarzaka, Shweugyi and Thabyinnyu pagodas. Other highlights include Shwesandaw pagoda, which offers panoramic views of the surrounding temples, and the intricate Mahayana Buddhist mural paintings at Gubyukggyi and Abeyadana temples. In the afternoon we will visit a small, locally-owned lacquerware shop to learn about this unique and painstakingly-crafted art for which Bagan is renowned. Finish your day tour by witnessing one of Bagan’s famously dramatic sunsets, watched from the top of a temple specially chose by your guide with the best views, whilst avoiding the crowds. Option: sunrise hot air ballooning over the temples of Bagan. Head southeast from Bagan by road to Mount Popa, which rises 1,518 metres from the surrounding plains. The famous Popa Taunkalat Monastery is perched dramatically atop a volcanic plug on the mountain’s slopes, and can be reached by climbing 777 steps – and skipping around hundreds of sometimes overly-confident macaques! The monastery offers stunning views of the mountain and back across to Bagan, and is famed for being home to 37 nats (Burmese spirits), which have a fascinating history. Returning to Bagan, we will stop at a locally-owned shop to see the process of making toddy palm juice (htan ye in Burmese), with the chance for a tipple! At end of a hard day’s exploring, relax by your pool whilst surrounded by ancient temples. After breakfast, head into the untouched mountainous wilds of Chin State with your local Chin guide, who was born and raised in this remote part of the country and speaks the language – and will be your companion for the next four days. It is 7 hours by car to the small mountain town of Kanpetlet, and along the way we will take in market towns and villages, with lunch at a roadside tea house. Arrive in Kanpetlet in the late afternoon and wander around the simple homesteads and churches of this quiet rural backwater; you will stay at one of the eco lodges higher up the mountain. Following a hearty breakfast at your eco lodge, drive to the trail head for Mount Victoria (known as Nat Ma Taung in Burmese or Khonuamthung in the local Chin language). From here it is a straightforward 5 hour hike to the summit and back, along the way observing many forms of fauna and flora – including rare native and migratory birds and unusual species of butterflies, rhododendrons and butterflies. Return to the trail head and we then drive northwards to Mindat, taking in local village life and dramatic views along the way – including the town itself, which is spectacularly situated along a mountain ridge. In and around Mindat, you will find members of the indigenous Dai, Upu and Ya tribes, of which the older womenfolk all have distinctive full facial tattoos – the designs of which are different from each other, indicating which village they are from. You will have the chance to meet the locals and visit their homesteads and small rural businesseses, then drive to Kyar Tong village and hike about one hour to an even more remote outpost, where will see a traditional Chin graveyard and meet a famed local hunter whose trophies are proudly mounted in his home. Finish the day with a trip to Mindat’s market, where you can buy traditional Chin wares – from combined knife and wine holsters (!) to delicate embroidery. Head back down from the mountains to the plains in time for a late afternoon in Bagan, with a chance for some further exploration – or simply enjoy a meal and quiet evening by the pagodas. 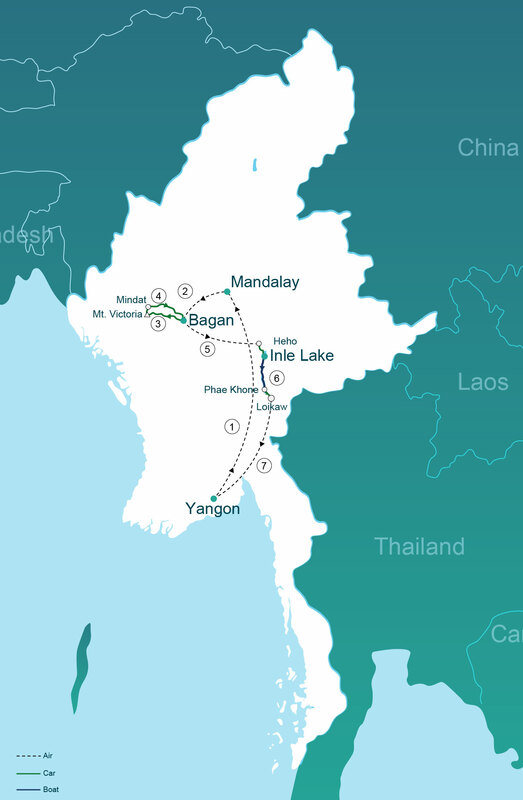 Fly from Bagan to Inle Lake. In the fresh air of the Shan hills, take a sightseeing trip of the floating villages and gardens on a long-tailed boat - visiting locally-owned silk weaving and lotus industries in Innpawkhine village before stopping in Nanpan to witness work at a Cheroot (traditional Myanmar cigar) factory. We continue our tour to see the revered Phaungdaw Oo Pagoda and, if we have time, stop at Leshae Village to witness the making of a Buddha image through the use of dried flour powder. Take the scenic and off-the-beaten track trip south to Phae Khone by boat, on the way visiting Sagar – offering an insight into a less-visited part of Inle Lake and allowing you to interact a little more with the local people who call the lake their home. The final one and half hour stretch to Loikaw is done by car, as a sluice gate blocks the river route. Arrive in the late afternoon in the sleepy capital of scenic Kayah State, until recently off-limits to foreigners. Most famous for the distinctive ‘long-necked’ women of the Kayan tribe, this area has one of Myanmar’s best established Community-Based Tourism programs, offering fascinating insights into local life and culture - and activities were developed based on special elements of local life which community members feel proud and comfortable to share with guests. We will head by car to Pan Pet village, located in the beautiful, jagged mountains to the south. Here you will be met by a local Kayan villager trained in community-based tourism practices, who will be your guide. You will have the chance to go on a hike in the mountains and visit the villages, meeting the ‘long-necked’ Kayan women, known for the brass rings that they sport around their necks, and buy handicrafts from their local stores. In the morning, we will visit the sights of Loikaw, including the Phoperyone Monastery and the unique Taung Kwe Pagoda, which is build on a limestone outcrop in the centre of town and offering panoramic views of the area, before transferring to Loikaw airport for your flight to Yangon. Arrive in Yangon and relax with the free evening to explore the growing dining and nightlife options in this fast-changing city. Depending on your flight time, take a chance to browse for Myanmar crafts and get last-minute gifts at the famous Bogyoke Aung San (Scott) Market and shop at the not-for-profit social enterprise Pomelo, which features delightful handicrafts made by artisans from poor background who have received sponsored training. See an entirely different side to the city at Myanmar’s first community skatepark, Pushing Myanmar. Opened in early 2016, this park offers a safe outlet for friends and strangers to meet and enjoy themselves in a way that would not have been possible until recently - a visit to will provide you with a unique perspective on urban life in this fast developing city. You will be shown around by one of the founders of this pioneering project. Price per person based on two person tour (twin hotel room sharing basis) during high season (Oct-Apr). Larger groups will pay less per person, single person purchase will mean a higher price.